Wire a combination outlet switch for the convenience of having a switch and a receptacle in the same location. Many bathrooms have a light switch for overhead lighting, but no outlet for an electric razor or hair dryer. The combination outlet switch remedies this disparity. The electrical wiring can be configured for the switch to control an overhead light, leaving the outlet power available independently. 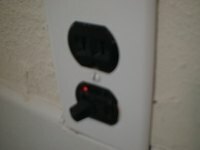 Use the combination as a replacement for switches in locations where a receptacle is also needed. Shut off power to the circuit at the breaker box. Tape or lock the box with a warning label to prevent anyone from inadvertently turning the power on before work is completed. Remove the cover plate by loosening the screws with a slotted screwdriver. Remove the mounting screws holding the switch to the top and bottom of the box with a Phillips screwdriver. Pull the switch out of the box by the edges and check the wires with a voltage tester to be sure the power is off. Remove the wires attached to the terminals of the switch. A black or dark colored hot wire will be attached to one side from the conduit or Romex. Another hot wire will be attached to the other terminal on that side to send power to the light. The green ground wire will be attached to the green ground terminal on one end. A white neutral wire runs straight through from the incoming source to the light box. Prepare the wires for connection to the combination. Make fresh cuts on the ends of both hot wires and the ground wire with wire cutters. Strip the ends of all three wires with the wire cutter blades to expose 1/2 inch of wire strands. Cut the neutral wire 10 inches from the incoming raceway. Strip both ends of the fresh cut. Also strip the ends of three extra wires for a 10-inch length and two 5-inch lengths. Twist the strands together between a thumb and finger at the ends of all the individual stripped exposures. Connect the hot wires. Twist the end of the incoming hot wire around an end of both 5-inch extra lengths. Cover the joined ends by twisting on a wire nut. Connect the other ends of the extra lengths to both the bronze terminals on the same side of the combination. Wrap the bare wires around the terminals in clockwise rotation. Tighten the terminal screws, covering the exposed wire under the heads. Attach the outgoing hot wire to a silver terminal on the other side of the combo. Connect the neutral wires. Twist the cut ends of neutral wire together with one end of the extra 10-inch length. Cap the connection with a wire nut. Wrap the other end of the 10-inch length around the silver terminal on the side with the outgoing hot wire. Secure it under the terminal. Connect the ground wire. The ground wire will be split and capped to accommodate the former switch. Wrap the freshly stripped end around the ground terminal at an end of the combo and secure it under the screw. Mount the combination inside the box with the outlet on top or bottom to preference. Replace the upper and lower mounting screws. Fit the faceplate over the combo and tighten the holding screw in the center. Do not attempt to wire switches or receptacles unless you are experienced or trained in electrical work. Electrical wiring must be done accurately to avoid hazardous shocks, fires and short-circuited appliances.